Candy Bar Cheesecake is the ultimate dessert mashup! 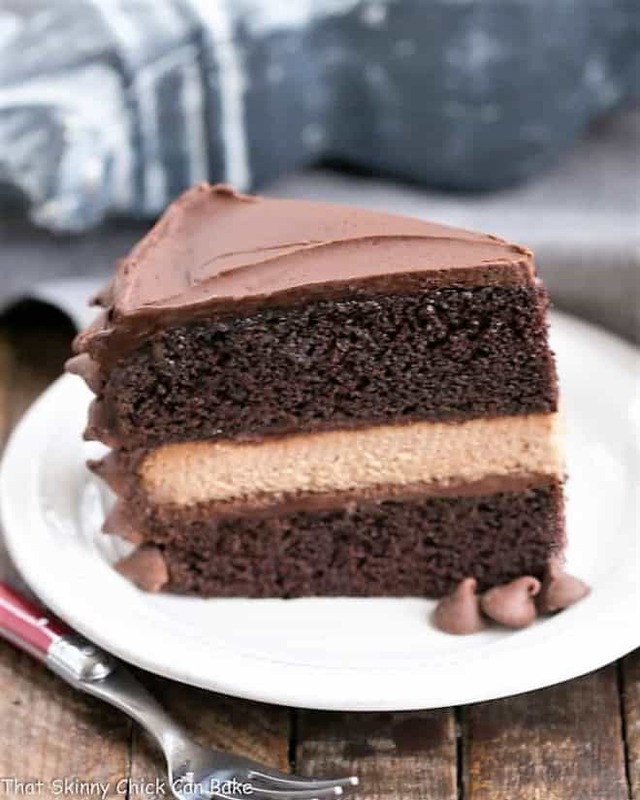 When you can’t decide between a slice of rich chocolate cake or milk chocolate cheesecake, make this chocolate cheesecake filled layer cake recipe! I first made this rich, unforgettable candy bar cheesecake recipe years ago. 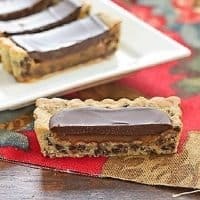 Served at The Cheesecake Factory, it was dubbed “candy bar” due to the use of Hershey’s milk chocolate in the cheesecake filling. This Cheesecake Factory Red Velvet Cheesecake looks extraordinary, too. I think they’re onto something! 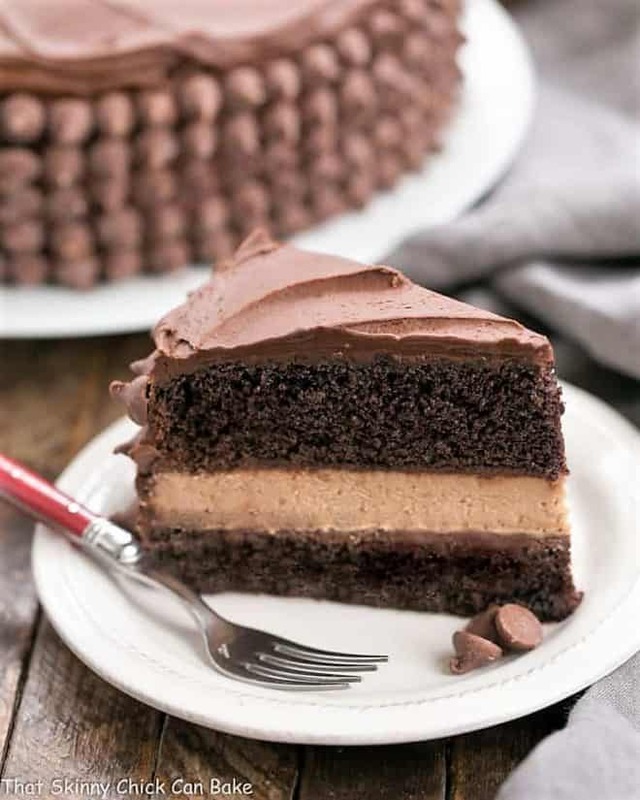 The thought of filling a classic iced chocolate cake with a chocolate cheesecake literally made my mouth water. A gargantuan dessert like this would take my family 2 weeks to finish, but I got a chance to remake it last weekend. Invited to a dinner party with some of my dearest friends, I volunteered to bring a dessert. Natch. 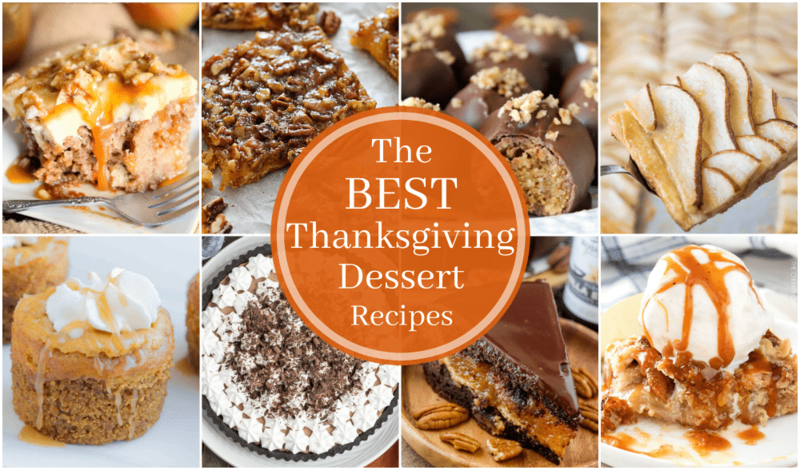 These friends are used to the shenanigans that come with a “blogger’s” dessert. Like slices cut out and reinserted. Thankfully, they’re always willing to be my guinea pigs. Plus, I get some honest reviews. Served at room temperature, this cake is moist and tender, the icing creamy and fudgy, and the chocolate cheesecake filling is amazing. I don’t think I’ve ever had such rave reviews from one of my desserts. A hit across the board. Our host squirreled away an extra slice that his wife found in the fridge the next day! One fellow swore he couldn’t eat another bite, but after about an hour of us gabbing around a roaring fire, I noticed his plate was empty. Another gal, who usually doesn’t indulge, ate a full slice. She thought the filling was a luscious ganache, but her cheesecake loving husband set her straight. I had just enough leftovers to bring a couple slices home, and Bill has savored every bite of the remainders. 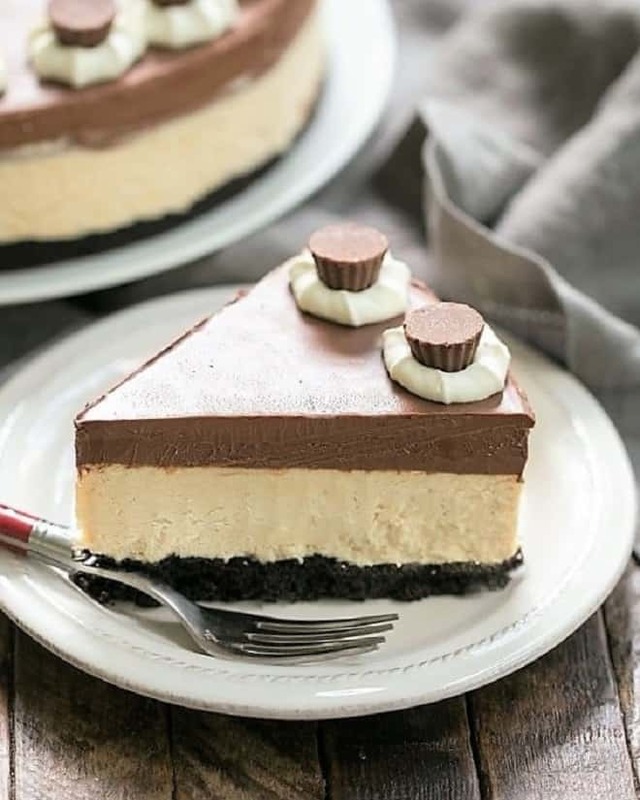 So if you need a showstopper for any party, make this exquisite Hershey’s Candy Bar Cheesecake at home! 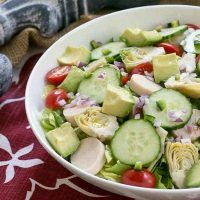 When time is tight and you are planning to have company for dinner, a few make ahead recipes are incredibly helpful. 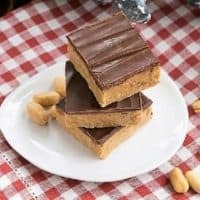 Luckily, all three layers of this candy bar cheesecake can be made ahead of time and stored in the refrigerator for a day or two or in freezer for a couple weeks. To freeze, the cake layers should be removed from the pans and each wrapped in plastic, then foil. For the cheesecake, let it cool to room temperature, then wrap the whole pan in foil and freeze. The layers should be defrosted in the refrigerator overnight before assembling. Just make the icing, frost and it’s ready to go! Candy Bar Cheesecake is the ultimate dessert mashup! 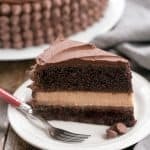 For a marriage of two chocolate desserts, make this chocolate cheesecake filled layer cake recipe! Preheat oven to 325º. Line a 10-inch round baking pan or 10 inch springform pan with non-stick aluminum foil or plain foil . Let the edges of foil extend over sides of pan and then spray the foil with non-stick cooking spray if not using non-stick.In your stand mixer fit with the paddle attachment, beat cream cheese, sugar and vanilla extract at medium speed with an electric mixer until creamy and smooth. Mix in eggs, one at a time. Blend just until eggs are incorporated. 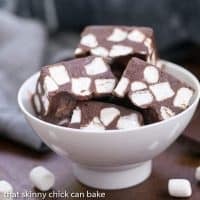 Stir in sour cream and melted chocolate. Pour batter into prepared pan. Bake for 45 minutes, or until the top just starts to turn golden. Let the cheesecake cool completely in its pan on a wire rack then cover and chill for 4 hours. Heat oven to 350°.Grease and flour two 10-inch round baking pans. Line bottoms with parchment rounds and grease. Spread a layer of frosting on top of one chocolate cake. Using edges of foil as handles, remove cheesecake from pan and peel away foil. Carefully layer the cheesecake on top of the frosted cake. If the cheesecake becomes hard to work with, you can place in the freezer for 20-30 minutes. Spread some chocolate frosting on top of the cheesecake layer. Place second chocolate cake on top and ice with frosting on top and on all sides. 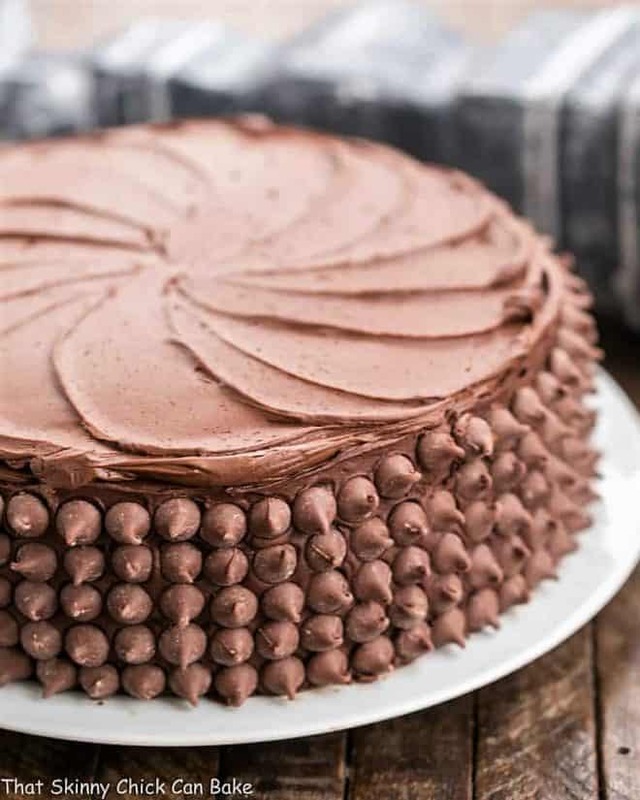 Decorate the sides of the cake with chocolate chips. Lots of chocolate! A spectacular cheesecake, Liz. Hahaha… I love that you talk about slices of cake cut out and then reinserted. I’ve done that soooo many times!!! Can you please bring this cake to my next party. I’m drooling too! Genius. Decadent. Festive. Perfect holiday make-ahead dessert, Liz. What a decadent, unique treat! I can see why it was such a hit. this sounds heavenly! wished I can comment on FB but still not happening for 4 more days! thanks for this delicious piece of heaven on a plate! merry christmas to you and your family! How decadent and delicious this looks! I love the combination of desserts. Yum! definitely another good decadently good dessert! Beautiful Liz! Every layer sounds delish! Wow – this is one gorgeous cake! I won’t rest until I try this one 🙂 Such a fan of chocolate and cheesecake so it’s perfect. Thanks for sharing! Perfect for chocolate lovers – looks stunning. Such a beautiful cake. One that my family would devour I’m certain in just 2-4 days. This is a keeper. That’s it. I’m moving next door to you immediately!!! This looks incredible. 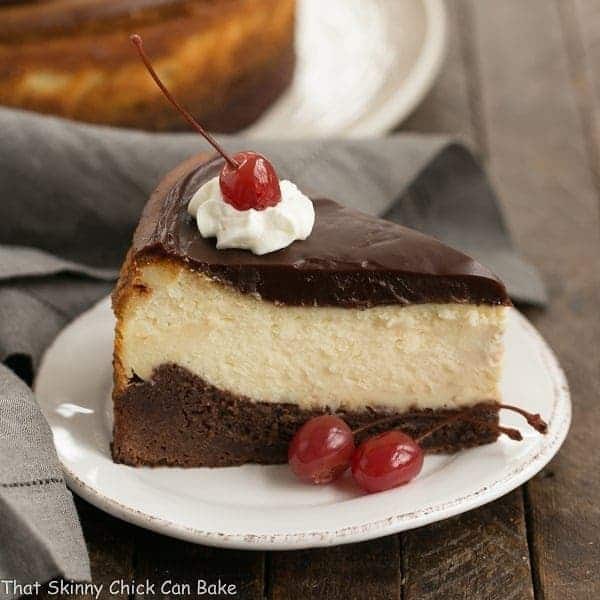 There isn’t much better than chocolate and cheesecake all in one cake! Amazing! What a dreamy cheesecake, love the layers! Love how you decorated the cake. What an amazing dessert! The cheesecake puts this so far over the top! Awesome! I made this last weekend and it was like a dream come true! Chocolate lovers beware it is addicting! Oh my! This cake looks amazing! This is every chocolate lover’s dream! I need this ASAP! This cheesecake didn’t last long when I made it. Everyone who had a piece loved it. Such an amazing cheesecake!! So good!